Do you ever gaze at the stars and lose yourself in the never-ending potential of the open universe? About how there’s so much out there and anything’s possible? Have you ever done that while sitting in a Bugatti Chiron? Well, ya can now. 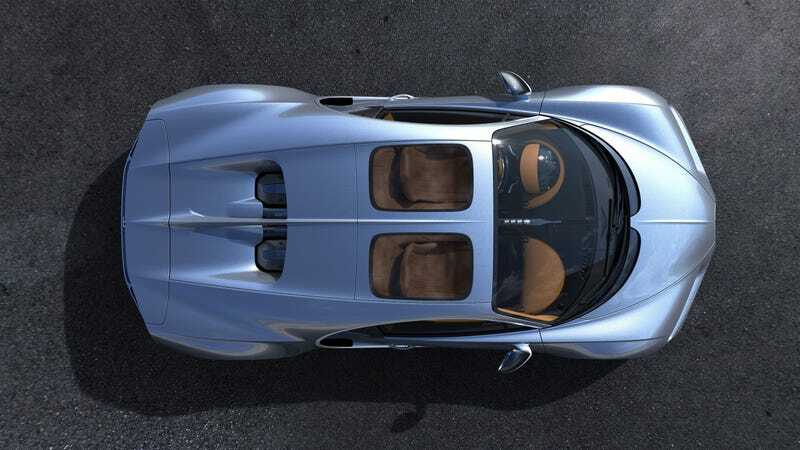 Bugatti has introduced a new option for the Chiron, called the Sky View, in which it will fit two glass panels to the roof of the car, right over the driver’s and passenger’s seats. Just look at that view now. “But what about wind nooooooooise?” you moan. Fear not! Bugatti wouldn’t let anything as annoying as noise from the rushing wind ruin your ride; the panels are made with thin glass and four “intermediate layers” which will cut the sound. “But what about UV raaaaaaays?” you moan. Fret not! Bugatti says that infrared radiation is reflected away from the inside of the car for maximum comfort. Nobody is wilting in a greenhouse on Bugatti’s watch. Also, UVA and UVB radiation is filtered out. Melanoma is for the poor. “But what if a drone is spying on meeeeee?” you moan. Worry not! The glass has been tinted “to prevent dazzle effects” and also protects your privacy. The government won’t ever know what’s going on in your Chiron. “But what about room for my heeeeeeead?” you moan. Stress not! The Sky View option gives you an additional 2.7 centimeters of headroom over the standard roof. Feel free to grow taller. With this new roof, cast your gaze heavenwards. Look up, not down, as you too often do. Be at one with the universe. Be at one with all the unending potential that your money can bring.